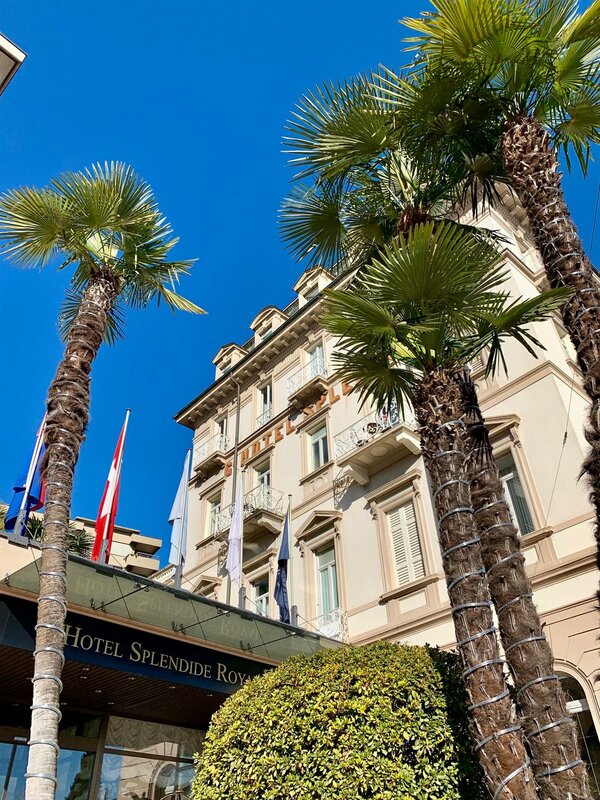 The Hotel Splendide Royal Lugano began as a palatial residence in 1887, and royalty and celebrities having been gracing the halls ever since. Just two years after its official opening, the owner wrote to the town mayor asking to create a garden in front of the hotel, thereby commencing the famous Lake Lugano promenade. It’s a leisurely ten-minute stroll for hotel guests to reach the city center along the tree-lined lakeside path which is wide enough for families, pets and runners alike. Nowadays, your Splendide getaway begins when Fernando meets you at the train station with water and the hotel minivan, instead of horse and cart. However, it’s just as exciting driving up the steep driveway from the lake, knowing that will be the view from your room in the palace! And, after an exclusive tour of the hotel by Emanuele Di Pasquale, Sales & Marketing Manager at the Splendide, I can assure you it is still an authentic palace. 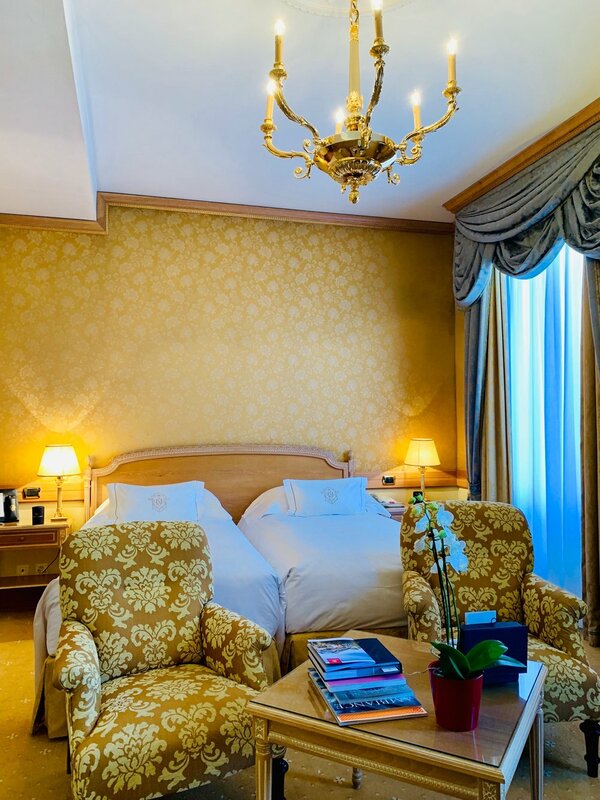 The hotel has been part of the Leading Hotels of the World group since 1960s as well as one of the elite group of 40 Swiss Deluxe Hotels – the most exclusive 5-star hotels in Switzerland. During my hotel tour with Emanuele, I discovered 130 years of heritage, not finding two rooms alike. The first and second floors are ‘noble’ floors with higher ceilings. We stayed in a stunningly appointed room with a large balcony overlooking the lake on the first floor. Our room was next to the 85m2 room which was once known as the Royal Suite, but renamed the Presidential Suite after President George Bush Snr stayed here. As you go up to the third and fourth floors the view over the lake and town is naturally more complete but the balconies and height of the ceilings reduce as you make your way up. Keep in mind this was a palace and the third and fourth floors were originally servants’ quarters. However, these rooms are also newly painted and wallpapered in pretty pastels, and so elegantly decorated that I’d happily try them all. The third floor has sweet French balconies and fourth floor only has windows. Also to note is that since the hotel is sitting on a hill and the ground floor ceiling height is immense, the first floor of the hotel is already regular 4th floor height from the street, so you really do have an expansive view over the trees and water, across to the mountains on the other side of the lake. The drawing hall overlooking Lake Lugano is where we spent most of our spare time at the hotel, for ‘Splendide Tea Time’, aperitif time and even dinner. It was just easier to remain there after a few glasses of the house Champagne, Perrier-Jouët. My favorite time of the day when I’m a hotel guest is always breakfast, and the sumptous buffet (naturally with a selection of the best Swiss cheeses) literally had me jumping out of bed in the mornings. I’ve not yet given up the morning ritual I developed at the Splendide of Jasmine Princess green tea by Newby (British of course)! The day that we departed from the hotel, Marco the restaurant maître d’ kindly surprised us with a big box of teas and chocolates. Rafael, the concierge thought of our every need throughout our stay, from printing out information on the city’s top restaurants, churches and cultural events especially tailored to us, to giving us tickets so that we could use all the local transport for free. We loved the marvelous hop-on hop-off ferry that circles the lake. We remained onboard for the two hour circuit enjoying the views and aperitif. Mille grazie to Rafael who has been looking after Splendide guests for over 30 years. When he arranged our five minute van ride back to the station he told us the platform number for our train and importantly, allowed time for us to pick up pretzels and Läderach chocolate before boarding. The Splendide is part of the family-owned Roberto Naldi Collection, which is just another reason why it feels like a home away from home - one that you never want to leave. Dottor Naldi spent a few years in Lugano and is very attached to the hotel. He is currently creating a pool and spa complex that will be inaugurated in July. It will shift the hotel forward into a new urban resort era. Here is everything you need to know about ‘Splendide Tea Time’, a tradition begun by the English nobility who gathered in the Chimney Room for tea they brought with them from England in the early 1900’s. This tradition is only offered over the winter months so now you’ll sadly have to wait until the weather chills down again for ‘Splendide Tea Time’. I highly recommend the champagne afternoon tea with Champagne Perrier-Jouët! Available daily, 3:00 – 5:30pm; Food handcrafted by Splendide’s pastry chefs and served with the tea of your choice, from the fine selection of 12 specialty teas and infusions from the world. I couldn’t resist the sound of ‘Tea of the Monks’ with hints of nutmeg, orange, sage and redcurrant. Treat yourself to Splendide’s afternoon tea with a glass of Perrier-Jouët Grand Brut. You may interested to read more about our Weekend in Lugano.